Setting up meetings and booking conference rooms can be a breeze when you use the scheduling assistant in Outlook Web App, which is part of Microsoft Office 365. When you select your meeting attendees and conference room, the Scheduling Assistant displays suggested times based on availability on the date and time you selected. This reduces the amount of time going back and forth with team members trying to nail down a meeting time. 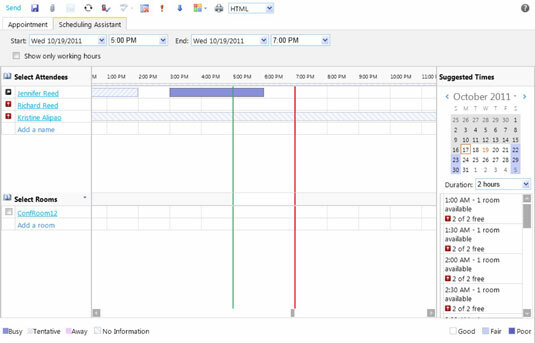 In Outlook Web App, click the calendar icon on the left navigation. Click the down arrow next to New and then select Meeting Request. A new untitled meeting window appears. Enter the attendees in the To field and the conference room you want to book under the Resources field. Click the Scheduling Assistant tab to display the suggested times. Select a suggested time or make adjustments to your time and date to find a time that works for everyone. Click Send to send the meeting invitation.